Cambridge, Massachusetts - In a speech before the staff of the Harvard Lampoon, Mr. Al Gore claimed that Mr. Hitler was more concerned about global warming than Mr. Roosevelt, Mr. Churchill, or Mr. Stalin. "Look at Hitler's armies" said Mr. Gore gesticulating wildly. "Hitler's armies used horse power, marching, bicycles and trains more than all of the allies put together. While Hitler was limiting the carbon footprint of his troops, the allies used trucks and jeeps which spewed prodigious amounts of Carbon Dioxide in the atmosphere. The carbon footprint of Hitler's armies was minuscule compared to the allies." Mr. Gore pointed out that while the allied air forces were in the air spewing tremendous amounts of carbon dioxide, Hitler grounded the Luftwaffe by not providing aviation fuel." Mr. Gore also noted that U-Boats were more fuel efficient and environmentally friendly than allied surface ships and that they were the first hybrids since they used electric power while submerged. "There is a direct line from the U-Boat to the Prius and other hybrid motor vehicles" Mr. Gore bellowed. When questioned by the audience concerning Hitler's policy of genocide against the Jews and other sub-humans, Mr. Gore replied "Everyone is whining about the carbon dioxide spewed from the smoke stacks of Auschwitz, Dachau, and Treblinka. Hasn't any one considered how much more carbon dioxide would have been spewed into the atmosphere if these six million had been allowed to live?" "Gore has his facts right, " Says Adolph Herman Rudolph Smith, Scientist-In-Residence of the American Nazi Party and a science advisor to Mr. Gore. 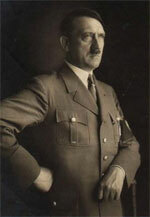 "He is emerging as our new Fuhrer.., I mean leader. He is the savior of mankind." Mr. Smith notes that Mr. Gore's will soon address other critical issues such as the hollowness of the earth, using UFO technology to stop global warming, and proving that global warming is real by playing rock CDs backward. Mr. Gore was dressed in an attractive pink business suit with matching pumps. He had a stunning floral silk scarf wrapped around his throat and a colorful corsage of violets and baby's breath. Mr. Gore was under the impression that he was selected as "Woman of the Year" by the Harvard Hasty Pudding Club.